Willy Bissainte and Benoit Reffe's Class 40, Tradition Guadeloupe were rightly proud as they crossed the finish line in the early hours of Sunday morning, having spent five nights at sea. A large contingent greeted Tradition Guadeloupe including Elizabeth Jordan, Commodore of the Antigua Yacht Club and Ian Loffhagen, RORC Racing manager. Every yacht competing in the RORC Caribbean 600 was welcomed back to Antigua, regardless of the time. 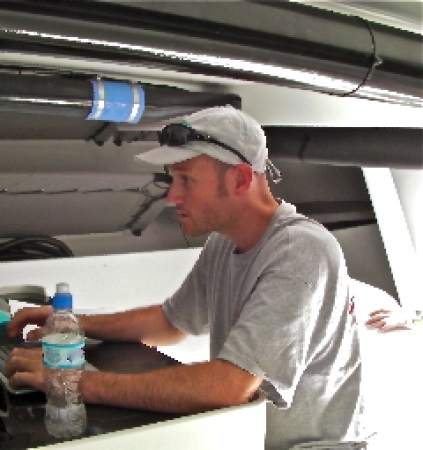 Jonathon Cornelius and his ABSAR team was on call day and night through out the race and piloted every yacht into Falmouth Bay. "We were never going to retire," said Willy Bissainte dockside. "The RORC Caribbean 600 is a big part of my training for the Route de Rhum, which I will be racing solo, later in the year. We always had at least a little wind, we kept going all of the time. It was great to have such a reception from the Antigua Yacht Club and the RORC. We will only be staying for a short while though, we must go back to work in Guadeloupe in just a few hours." Willy Bissainte and his co-skipper Benoit Reffe picked up the Concise Trophy for the best Class 40 and the class trophy for IRC Zero. After a quick shower, the two sailors who defied the unusual weather, set sail for home. 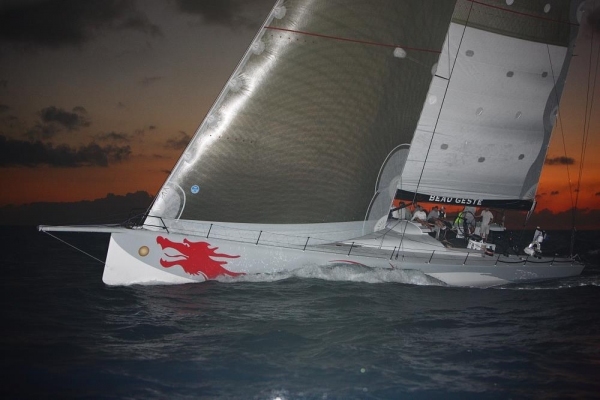 The last yacht in the 2010 RORC Caribbean 600 was finally accounted for. Although several boat are still racing, Richard Bamford's Swan 38 Dolfijn retired this morning which means that at tonight's prize giving Karl Kwok's Farr 80, Beau Geste, will be awarded the RORC Caribbean 600 trophy for best yacht overall under IRC, the line honours trophy for monohulls and Class trophy for IRC Super Zero. "I have never cleaned up as well before so it feels really good," smiled Karl Kwok upon hearing the news. "There may have been a lack of wind but we kept on going all the time and when the wind was with us we had flat water and some fantastic sailing. Beau Geste has a great spirit, I have been friends with Gavin Brady for two decades and we sit down and decide who we will have on board. Friendship is very important to me, we choose the best sailors but also the right people. I have to say a big thank you to Gavin Brady and the two watch captains, Jonno Swain and David Endean but all of the crew did a great job. Beau Geste races all over the world and I would like to invite all of the competitors we come across to do this race. The sailing is as good as can be and I have enjoyed it immensely." Winner overall of the CSA division and second place overall under IRC is Richard Oland's Southern Cross 52, Vela Veloce. "We had a close battle with Privateer who beat us by less than a minute in our last encounter, so beating them this time was a bit of payback," admitted Richard Oland, skipper of Vela Veloce. "Privateer are good sports and I am sure we will share a beer with them tonight. Although I have done a lot of cruising here, this is the first time I have raced in the Caribbean since the 60s. The boat comes from New Brunswick, Canada and it amazes me why people don't come down here and enjoy these water. BLESMA stands for British Limbless Ex Service Men's Association. Based in the United Kingdom, BLESMA helps with the rehabilitation of servicemen and women proving there is life after amputation. 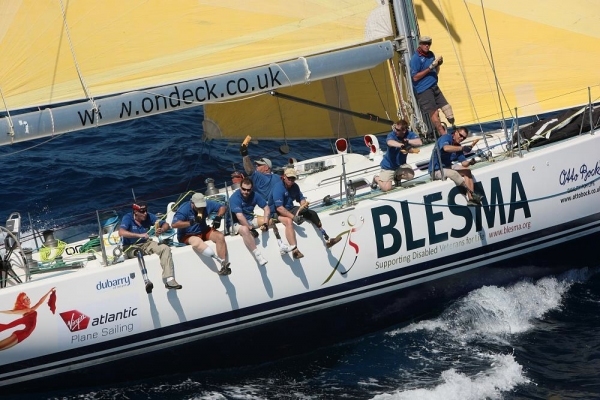 15 members of BLESMA are crew on board OnDeck's Farr 65, Spirit of Juno. The boat has not been modified to accommodate the crew, they have had to adapt to life at sea. Racing a Farr 65 requires a considerable amount of raw muscle power and a great deal of stamina; Shifting sails around and operating the pedestal grinders is back breaking work, even in light airs. A key goal for BLESMA revolves around amputee helping amputee and sailing big boats is all about teamwork. For the crew of Spirit of Juno, the RORC Caribbean 600 is an ideal way to develop self-confidence and personal satisfaction. Few of the crew have much sailing experience but they are competing as a unit, sharing the burden, making the difficult task of racing over 600 miles achievable. It is worth remembering that as servicemen, they were physically very active and racing in the RORC Caribbean 600 allows them to carry on competing in sport on a level playing field. They are taking on a challenge and getting a buzz from sailing in one of the most spectacular places on the planet. 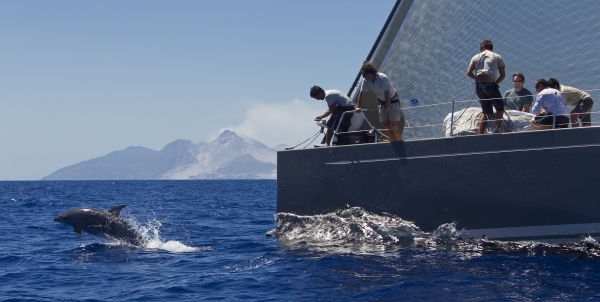 The RORC Caribbean 600 attracts every type of entry from all over the world; family owned performance cruisers to high performance custom boats with professional crew. All are attracted to the challenge, the satisfaction and sense of achievement of taking part in a great yacht race. The BLESMA team is no different. 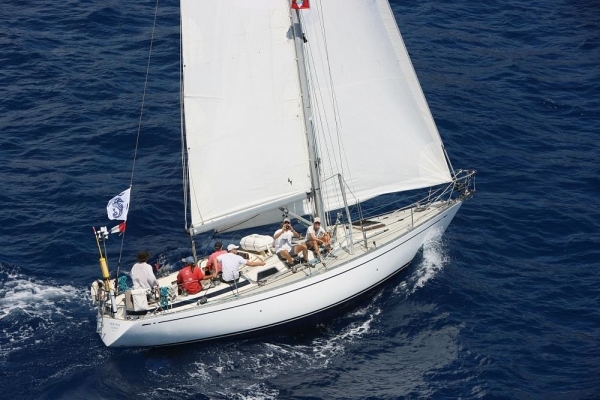 Day four of the RORC Caribbean 600 and the crew of Region Guadeloupe and Beau Geste will, no doubt, be trying to catch up on lost sleep having finished late last night. Meanwhile the yachts still racing are eager to make good progress. The good news for them this morning is that normal service has resumed. A moderate easterly breeze has developed. Karl Kwok's Beau Geste is currently leading overall but it will be some time before the yacht from Hong Kong will know if they can claim the double win and add a handicap win to their monohull line honours. The two canting keel Cookson 50s have had a tremendous battle around the course and their private duel is still very close. However, it is highly unlikely that Lee Overlay Partners or Privateer will finish in time to challenge Beau Geste for the overall title. 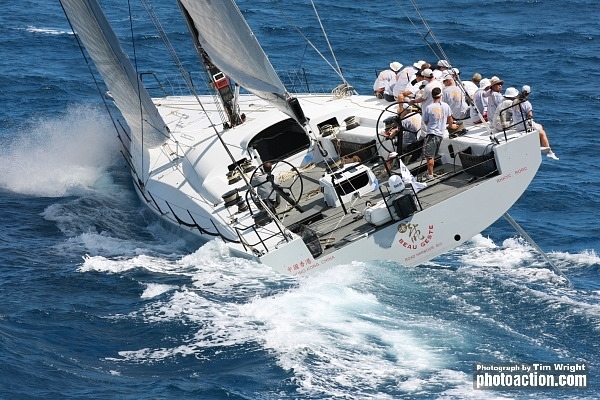 Danilo Salsi's Swan 90, DSK Pioneer Investments finished the RORC Caribbean 600 on 25th February 2010 at 11:25:41. The magnificent Swan was the second monohull home and in the light conditions they were never going to beat Beau Geste to Antigua. "It was more Mediterranean than Caribbean," commented Danilo Salsi , "because the wind was much lighter and the wind shadow effects are something that we have to deal with in the Mediterranean. It has been completely different to last year but we have enjoyed it as much. 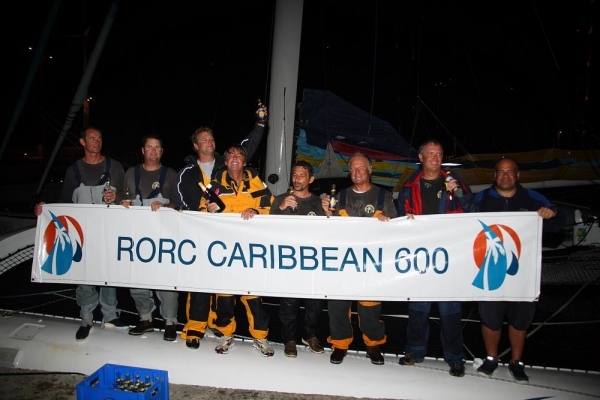 The 2nd RORC Caribbean 600 has been just as challenging but in a very different way." This was the first time Karl Kwok has sailed in the Caribbean and by the smile on his face it won't be the last. "I really enjoyed it, great sailing except for the long beat to Guadeloupe which meant we had no chance of beating Leopard's record but this is a great race and well run by the Royal Ocean Racing Club." Helmsman Gavin Brady was very impressed with the race course as he explained dockside. "This race has something for everyone, certainly a race course where you have to concentrate all the time. I sailed in shorts and T-shirt the whole race, even though the wind strength got up to 20 knots. That's something you don't say very often after a 600 mile classic." John Burnie, skipper of Region Guadeloupe spoke dockside in Falmouth Harbour. "This year's race was more difficult in many respects, especially tactically because of the wind coming from the South. In 2009 we rarely deviated from the rhumb line but in this race we were constantly having to alter course to avoid wind shadow from islands and areas devoid of wind. We got caught in the wind shadow of St. Kitts and Beau Geste caught us up, we were swapping gybes with them for some time before they too hit a quiet patch and we wriggled free". Marc Glimcher's J 122, Catapult and his crew are all from East Coast of the United States and compete in many regattas; often in a fleet of J 122s. 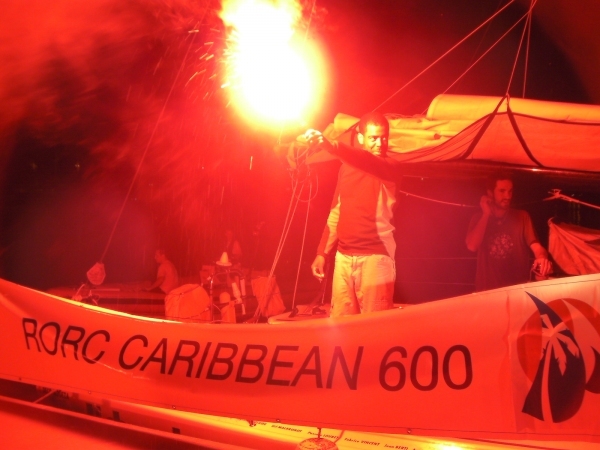 Marc and his crew are having a great race and currently lead the RORC Caribbean 600 overall on handicap. At 1300 local time they were rounding St.Maarten to head south on the long beat to Guadeloupe. Catapult crewman, Brock Callen took a few minutes to talk about the ride: "It's freezing cold back home in Massachusetts right now and I am wondering why my sailing buddies at home aren't doing this race? The sailing conditions are just gorgeous. Last night as we were on deck, just in t-shirts, a Humpback whale came right up to the boat. Watching the sun go down with the spinnaker up and surf under the hull is a great experience. We have a good spirit on board and we all have specific jobs, especially on manoeuvres. At Barbuda we gybe peeled from the 3A to the 2A and it was a smooth operation. It paid off, as we passed several boats shortly after the rounding. Things have been going really well and the skipper and the crew are enjoying this race, so much. The next leg looks like it will be a beat, possibly all the way to Guadeloupe and the wind may go lighter. We will be trying not to get too frustrated and concentrate on sailing the boat to the best of our ability." Things are a little different for Tom Addis this February. In 2009, Tom was in huge seas, monster waves and freezing cold temperatures, on route to Qingdao, in the 2008-09 Volvo Ocean Race. "We were a man down with Bouwe confined to a bunk and we were taking a pounding. It was the most brutal conditions I have ever experienced," commented Tom. Back in February 2009, it was a case of survival mode but with impeccable boat handling, true grit and determination, Telefonica Blue made it to China. The Spanish entry was not only intact but also winners of Leg Four of the Volvo Ocean Race 2008-2009. Right now, Tom is about as far from Qingdao as you can get without being in outer space. The Australian navigator is aboard Karl Kwok's Farr 80, Beau Geste racing in the RORC Caribbean 600. 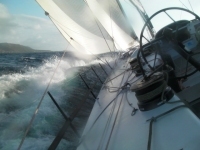 The race starts and finishes in Antigua, after 605 miles of ocean sailing. There are 14 tropical islands on the race track and warm Trade Winds supply some fantastic conditions, both day and night.